CustomPitch, our Custom Sales Presentation App, is a custom branded, updateable iPad presentation app that allows you to store and present all your materials from within one app. With this app you are able to easily add photos, video content, spec sheets, PDFs, product descriptions, slide shows and other offerings all in one place, and be able to showcase all of them to a customer without the need of a slow and bulky laptop or cumbersome print material. It even has an easy-to-use Content Management System, so you can update the app anytime you want. With our Custom Sales Presentation App, you are only a tap or two away from real revenue. Imagine using this iPad tablet app to present to small or large groups of potential customers or walk the trade show floor with this handy, high-tech device. No more fumbling through folders, scrolling through your phone or wondering if you have the latest documents, pictures and videos. CustomPitch bundles all your materials into one easy to use app, with your brand always front and center. This app is designed with you and your business in mind. 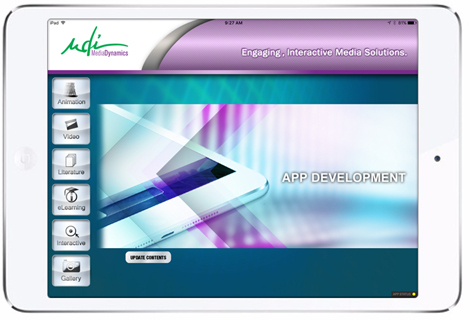 Contact Milwaukee based Media Dynamics to find out how we can help you build YOUR app.